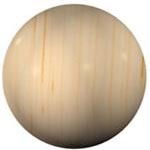 Interior Wood balls are available from a 2" diameter up to 14-3/4" diameter. Wood balls can be ordered split (must be in pairs) or with a flat top and/or bottom. Hanger bolts or wood screws can be installed as an option. 2" diameter. Can be ordered split or with a flat top and/or bottom. 3" diameter. Can be ordered split or with a flat top and/or bottom. 4" diameter. Can be ordered split or with a flat top and/or bottom. 6" diameter. Can be ordered split or with a flat top and/or bottom. 8" diameter. Can be ordered split or with a flat top and/or bottom. 10" diameter. Can be ordered split or with a flat top and/or bottom. 12" diameter. Can be ordered split or with a flat top and/or bottom. 14" diameter. Can be ordered split or with a flat top and/or bottom. 14-3/4" diameter. Can be ordered split or with a flat top and/or bottom.